Cover Story : English style with a Catalan twist, the private members’ club makes its Barcelona debut. 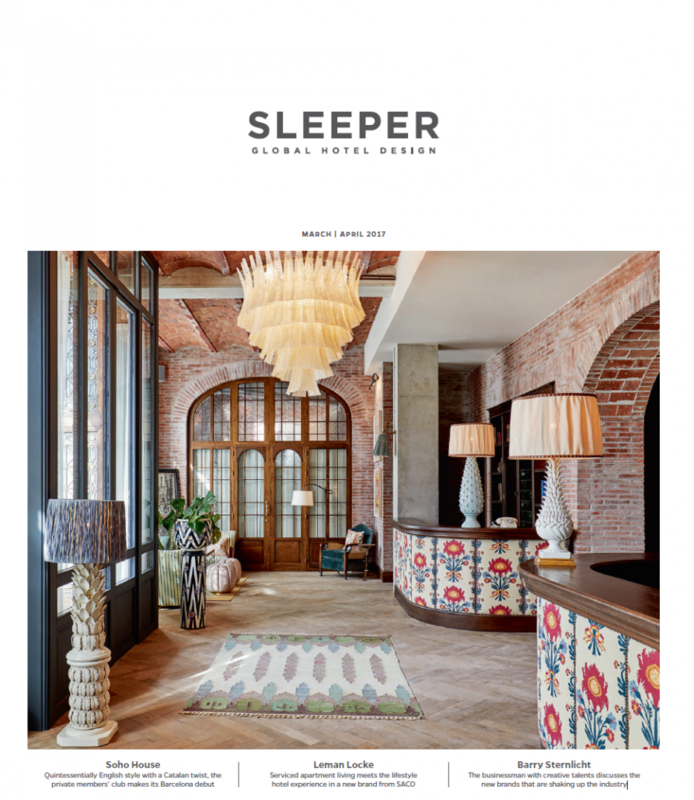 The latest Soho House is a conversion of an 18th century building overlooking Port Vell, its interiors giving the group’s signature look a Catalan twist. It has taken the backing of two billionaires – fashion mogul Richard Caring, who bought out many of the club’s original founders in 2008, and American investor Ron Burkle, who acquired a 60% stake in 2012 – to really ramp up Soho House’s overseas expansion. What was once a UK-centric group, with London clubs in Soho, Chiswick, Notting Hill and Shoreditch alongside countryside properties Babington House and Soho Farmhouse, has become more international in its outlook of late, with outposts launched in New York, Toronto, Los Angeles, Berlin, Chicago, Istanbul, and now Barcelona. Along the way, its recent houses have seen the model evolve from private members’ clubs into something more akin to a fully-fledged hotel – though the guestrooms are only one element of a business that still generates the majority of its revenues from F&B and membership fees. Such rapid expansion has put a strain on cashflow, as widely reported in the financial press. Yet the waiting list for membership, 32,000 strong at the last count, remains the envy of its competitors. And as it has increasingly invested in the real estate that houses its properties, through acquisition rather than lease, its investors stand to benefit from the upswing in property values that typically follows the launch of a Soho House in any up-and-coming neighborhood. Its latest opening in Barcelona is very much a case in point. The design has been spearheaded by Jones himself, and an in-house design team overseen by Managing Director Vicky Charles and former European Design Director James Waterworth. They have been careful to balance Soho House’s signature, quintessentially English style with authentic local influences. Inspiration was taken from classic Catalan design, with gothic architecture influences and double-height, vaulted ceilings. The lobby is a beautifully styled space with herringbone parquet floors, brick archways and a colorful blend of fabrics, rugs and furnishings. Guestrooms have a modern but rustic look, with warm, Mediterranean colors and traditional Spanish patterned textiles. Bathrooms feel light and simple with local tiles, bronze fittings and Devon & Devon copper bathtubs. Furnishings throughout are a mix of mid-century European pieces with local antiques and custom-made designs from the Soho House team. Applying this intensely bespoke approach across a property with 57 guestrooms is a challenge in itself. The collection of vintage ceramic lighting took over two years to amass in the run-up to opening. A huge antique rug, found in Madrid, was cut up and used in the public areas. Tilling for the fireplaces was sourced in the nearby Barri Gotic, whilst wallpapers are by Lewis & Wood. This is not the largest house in the group, but the facilities are comprehensive. Another balancing act for Soho House to consider with any new opening is that of accessibility – which elements are members only, which are for hotel guests, and which are open to the public. In Barcelona, guests staying in the bedrooms have access to the private members’ spaces, including the fifth floor club area, the rooftop pool and Cowshed active gym, with its House Ride spinning classes and yoga studio. Public areas include a Cecconi’s restaurant on the ground floor and the Cowshed Relax spa with its impressive indoor pool and a design inspired by a traditional Spanish pharmacy. Additional areas available for private hire include a 36-seat screening room with velvet upholstered armchairs and footstools; the Green Room speakeasy in the basement; The Marina Room members’ event space on the fifth floor; and La Mercé – an annex to Cecconi’s with its own lounge and bar. Food is a mix of familiar Soho House staples (the flat iron chicken and avocado on toast are present and correct) alongside Spanish influenced dishes such as Iberico pork presa, Galician beef tartare and a wide range of tapas. In fact, the menu offers a taste of Soho House Barcelona in microcosm – built upon Anglo-American foundations instantly recognizable to its worldwide membership, but infused with authentically Spanish and Catalan flavors to attract guests from the surrounding city. Conde Nast Traveler | April 18, 2017. Conde Nast Traveler Spain | July 2017.